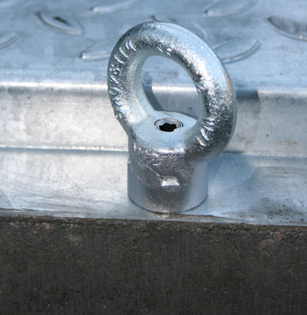 When laying BIRCOmassiv channel, the ring nuts screwed onto the steel bolts play a valuable role, enabling the channel panels to be moved easily and inserted precisely into a pre-assigned slot. This reduces digging and makes for better channel laying. Standard drainage panels can be moved using any laying grippers commonly found on the market. We develop individual laying accessories based on your specifications. Up to nominal width 500 channels of BIRCOcanal are fitted with cast-in anchor sleeves. With the help of lifting loops the channels may be moved easily in vertical direction. This concers also the concrete covers.